Trees4Future is an Integrative European Research Infrastructure project that aims to integrate, develop and improve major forest genetics and forestry research infrastructures. It will provide the wider European forestry research community with easy and comprehensive access to currently scattered sources of information (including genetic databanks, forest modelling tools and wood technology labs) and expertise. This will help forestry researchers and the European forestry sector to respond, in a sustainable manner, to increasing demands for wood products and services in a context of genetic adaptation and changing climatic conditions. It will create a new and better linked research infrastructure which will increase our knowledge about the adaptation of forests to climate change and tree characteristics suited for tailor-made wood supply - thus optimising the short- and long-term exploitation of forest resources. 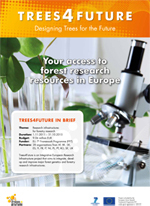 The Trees4Future Transnational Access programme offered external users free access to 28 state-of-the-art forest research structures and facilities across Europe. The facilities on offer focused on genetics, genomics and tree breeding, (eco-)physiology and biotechnology, wood science and technology and modelling/data analysis. They included genetic databanks, biobanks, laboratories, models and decision-support systems. "This was a great opportunity to visit and use the facilities under expert guidance and build up a personal network of professional contacts." Find out what Trees4Future applicants thought about their visits. See publications resulting from a Trees4Future visit.